Who doesn't like awards, especially when they are received unexpectedly? I do! 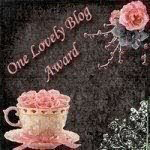 Last week, blogger Sarah of Sarah Who Reads Too Much surprised me with the One Lovely Blog Award. Whoo-hoo! Thank you, Sarah, I appreciate the honor. I'm continually finding new blogs to read, many from blog hops, linky parties, and memes in which I participate. The following are my picks of some of the many engaging blogs to which I subscribe. You may find one, several, or all blogs that appeal to you, dear gentle readers. Check 'em out! And, of course, don't forget to check out Sarah Who Reads Too Much! Thanks again, Sarah! Grab the award from this blog. Post it on your blog with the name of the person who granted you the award and his or her blog link. Pass the award to up to 15 other blogs that you’ve recently discovered. Contact the bloggers to let them know that you have chosen them for the One Lovely Blog Award. Why thank you! I'm flattered that you like my blog! I've displayed my award proudly on my blog! Congratulations on your ever so deserving award. You're the greatest! I am so honored that you pass it on to me. I thank you. Wow! Thanks so much for thinking of me! I will have to check out all of your other new found reads, I'm sure I will be humbled by the company. Congratulation for your great award.Thanks for sharing this. You are quite welcome... and thank you for your kind words! Congrats on your award and thanks so much for thinking of me!!! This is great. I'm really flattered; thanks for thinking of me. Thank you for stopping by my blog and leaving a comment. Am sorry for dropping a line on an old entry. If you want to explore another new blogs to read, please visit our blog.